Noisy neighbors? Can’t sleep? Need to chill out? 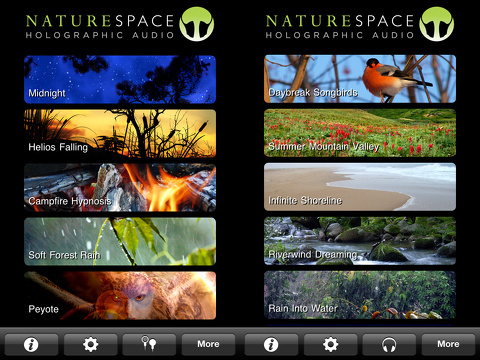 Naturespace’s iPhone, iPod Touch, and iPad app by Holographic Audio provides a soothing 3D soundtrack to limit distractions. One of the impressive aspects is the headphones setting that amplifies and enhances the 3D quality. The free universal download contains six different soundtracks, and you can purchase additional soundtracks for as low as $.99 within the Naturespace iPhone app. The Naturespace iPhone app opens with a straightforward, well-organized home screen. The screen is filled with a list of the six free options that have a lovely photo to complement the title. At the bottom of the screen, you will find a simple navigation bar to access info, settings, enable earbud enhancement, and the Naturespace Store. The information icon briefly explains the gestures required, but it also included an interesting item that speaks to the quality of the audio. The developers at Holographic Audio actually recorded these soundtracks live in the elements. They did get wet and dirty to help you get to sleep or find inner peace. The settings icon has a simple sleep timer that you activate and set with interface similar to making adjustments to your iOS settings. Another important tip is to play with your volume adjustment, since headphones vary widely in sound and quality. You are warned that loud doesn’t necessarily mean better. The six soundtracks included in the free download have a nice range. The selections include Summer Mountain Valley, Infinite Shoreline, Riverwind Dreaming, Rain Into Water, and Night at Lake Unknown. The Naturespace Store has selections ranging from rain, waves, and winds to abstract and science fiction. The quality of each soundtrack is crisp and creates an incredible aura. 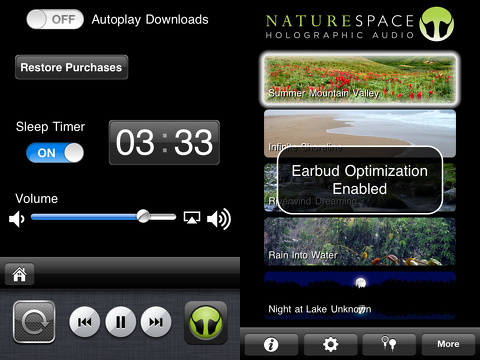 Naturespace’s iPhone, iPod Touch, and iPad app has a superior sound and essence than many of its competitors. Massage therapists, spas, yoga studios, and your friend who constantly complains about not being able to sleep would benefit from Naturespace. In fact, my sleeping soundtrack iPhone app has been replaced. If you try it, you will quickly be hooked. AppSafari review of Naturespace: Relax Meditate Escape Sleep (3D Sound – The most effective audio therapy for stress relief, sleeping, relaxation and meditation) was written by Jenni Ward on December 14th, 2012 and categorized under App Store, Free, Health, iPad apps, Music, Productivity, Universal, Utilities. Page viewed 4852 times, 2 so far today. Need help on using these apps? Please read the Help Page.